According to the Federal Reserve Bank of New York’s latest Household Debt and Credit Report, total household debt outstanding rose by $24 billion, 0.2%, between the fourth quarter of 2014 and the first quarter of 2015. The small rise in household debt outstanding over the first quarter of 2015 reflected increases in student loan debt, $32 billion, auto loan debt, $13 billion, and mortgage debt, $1 billion. However, gains in student loan and auto loan debt were partially offset by a $16 billion dollar decline in the amount of credit card debt outstanding and a $6 billion decline in other household debt. Other household debt includes sales financing loans, personal loans, and retail loans such clothing, grocery, department stores, home furnishings, and gas loans. Meanwhile, the outstanding amount of home equity lines of credit was unchanged over the quarter. A previous post illustrated that the amount of mortgage debt outstanding increased over the past two years. Following 4 consecutive years of declines, mortgage debt outstanding expanded by 0.2% at the end of 2013 and by 1.5% at the close of 2014. The Federal Reserve Board’s Financial Accounts of the United States, formerly known as the Flow of Funds, indicates that growth is taking place in multifamily lending, while loans secured by single-family residential properties continue to decline. The Federal Reserve Board’s Financial Accounts of the United States is a comprehensive set of accounts that includes detail on the assets and liabilities of households, businesses, governments and financial institutions. According to Figure 1 above, outstanding loans secured by single-family residential real estate totaled $2.942 trillion at the end of 1992, roughly 11 times greater than the amount of outstanding loans secured by multifamily residential real estate, $271 billion. Although the dollar value of loans secured by multifamily residential real estate rose between 1992 and 2007, the amount of loans secured by single-family residential real estate increased more. 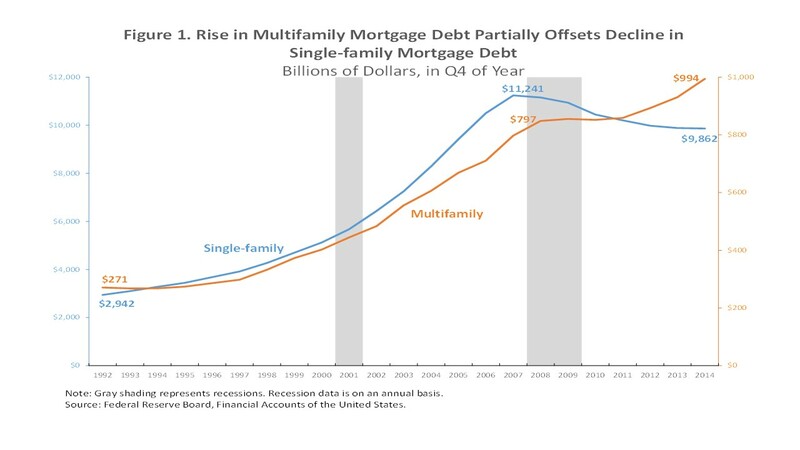 Between 1992 and 2007, the year that the amount of mortgage debt outstanding secured by single-family residential real estate peaked, the amount of outstanding loans secured by multifamily residential real estate rose by 194.3% to $797 billion, but, loans secured by single-family residential real estate grew by 282.1% to $11.241 trillion. However, after reaching its peak, loans secured by single-family residential real estate have declined while outstanding loans secured by multifamily residential real estate have, except for 2010, continued to grow. Figure 1 above shows the opposite trends in these two data series. This chart is commonly referred to as a “scissors” graph because all or a portion of the two series are moving in opposite directions. Between 2007, when the outstanding amount of loans secured by single-family residential real estate peaked, and 2014, outstanding loans secured by single-family residential real estate declined by 12.3% to $9.862 trillion, falling in every included year. Over this same period, loans secured by multifamily residential real estate rose by 24.7% to $994 billion, rising in every year except 2010. At the end of 2010, it was 0.3% less than its level at the end of 2009. Moreover, between the end of 2013 and the end of 2014, the amount of outstanding loans secured by single-family residential real estate fell by $22.1 billion, but the amount of outstanding loans secured by multifamily residential real estate rose by $63.6 billion. The continued contraction in the total outstanding amount of loans secured by single-family residential real estate may reflect declines in junior-lien mortgages and home equity loans, while the outstanding amount of first-lien mortgages secured by single-family residential real estate has likely stabilized, albeit at a level below its housing boom peak. The Federal Deposit Insurance Corporation’s Statistics on Banking provides data on the balance sheets of depository institutions. The Statistics on Banking is a quarterly publication compiled by the Federal Deposit Insurance Corporation (FDIC) that provides detailed aggregate financial information as well as key structural data, such as the number of institutions and branches for all FDIC-insured depository institutions. The measurement of outstanding loans secured by residential real estate, both single-family and multifamily, in the FDIC’s Statistics on Banking closely tracks similar data provided by the Federal Reserve Board’s Financial Accounts of the United States. 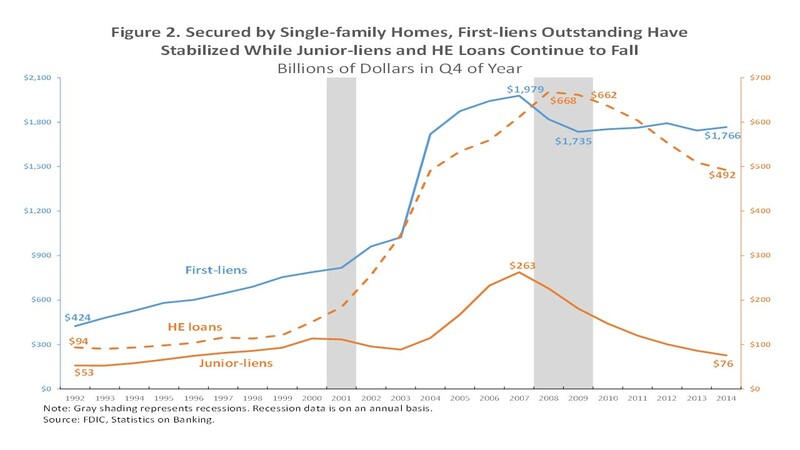 According to Figure 2 above, the outstanding amount of first-lien mortgages secured by single-family residential real estate peaked at $1.979 trillion in 2007. By 2009, first-lien mortgages outstanding fell 12.3% to $1.735 trillion. At the end of 2014, the outstanding amount of first-lien mortgages secured by single-family residential real estate was $1.766 trillion, 1.8% greater than its 2009 level. After reaching their respective peak levels, the outstanding amount of home equity loans and junior-lien mortgages that are both secured by single-family residential real estate have continued to shrink. The outstanding amount of home equity loans peaked at $668 billion in 2008 and subsequently fell by 1.0% to $662 billion in 2009. At the end of 2014, the outstanding amount of home equity loans secured by single-family residential real estate total $492 billion, 25.6% less than its 2009 level. At the same time, the outstanding amount of junior-lien mortgages secured by single-family residential real estate reached a peak of $263 billion in 2007. By the end of 2009, the outstanding amount of junior-lien mortgages fell by 31.1% to $181 billion. At the end of 2014, the outstanding amount of junior-lien mortgages secured by single-family residential real estate was $76 billion, 28.8% of its 2007 peak.